Nudo Architectural | Newcomer Architectural Products | Inc. The Endurex 500 Series provides energy savings while enhancing the life and the aesthetics of your building exterior. Nudo’s innovative Endurex 500 combines all the benefits of Moisture Resistant ACP/ACM panels with a foam-insulating core. 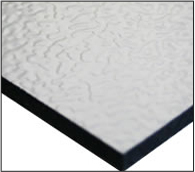 Rather than standard hardboard stabilizers that can absorb water, or even the next generation of corrugated plastic stabilizers, which have less rigidity and impact resistance, the Endurex 500 panel has solid plastic core stabilizers backed by an extra layer of smooth or embossed aluminum behind each stabilizer. The result is the first in-fill/store-front/glazing panel of its kind. The use of the Endurex 500 has grown every year since Nudo first introduced the concept in 2007. Endurex 500 is Class “A” Fire-Rated and carries a limited 5-year warranty with the standard Polyester Paint Finish. Endurex 500 panels are manufactured to meet the requirements of a standard 1″ insulated glazing panel. Panel thickness is available from as thin as 7/8″ to 4″ thick. The Endurex 515 is a standard 1″ insulated glazing panel with corrugated plastic stabilizers on both sides of a 2lb EPS foam core. The Endurex 515 is more moisture resistant than the Endurex 525, but provides less impact resistance than the Endurex 505, 525, 535 or 555. The Endurex 515 is available in a Kynar or Anodized finished aluminum with a limited 20-year finish warranty. Endurex 515 panels are manufactured to meet the requirements of a standard 1″ insulated glazing panel. Panel thickness is available from as thin as 7/8″ to 4″ thick. The Endurex 525 is the most traditional 1″ insulated panel using tempered hardboard as stabilizers around a 2lb EPS foam core. Although still specified, the Endurex 525 panel does not offer the moisture and impact resistance found in the Endurex 505 and 555. The Endurex 525 is available in a Kynar or Anodized finished aluminum with a limited 20-year finish warranty. Endurex 525 panels are manufactured to meet the requirements of a standard 1″ insulated glazing panel. 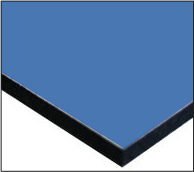 Panel thickness is available from as thin as 7/8″ to 4″ thick. The Endurex 535 is a fire-resistant, sound-reducing panel that can be glazed into acoustical window or curtain wall systems. The panel is fabricated with sound resistant substrates and a fire-resistant insulating core. It is most often used when maximum fire-resistance is desired. Often used for schools and hospitals, the Endurex 535 is Class “A” Fire-Rated and carries a limited 20-year warranty with a Kynar or Anodized finished aluminum. Nudo’s Endurex 555 advances the insulated “impact” or “hurricane” panel from the stone age to the space age. While other competitors rely on a heavy sheet of steel to provide the impact protection, Nudo has engineered a lightweight, super strong composite material to do an even better job. Although lighter and much easier to cut and install, the Endurex 555 panel passed all National “hurricane” testing requirements. The benefits go far beyond the tremendous strength-to-weight ratio. The Endurex 555 composite stabilizers are also impervious to moisture. The panel is completely balanced and not dependent on a “steel side out” installation. We didn’t stop with a lighter, stronger, moisture resistant and easy to install panel. The Endurex 555 also offers great insulating values. Since the composite stabilizers are only half the thickness of the competition’s panel, and there is no heavy sheet of steel, the Endurex 555 provides more insulation in the same thickness panel. The Endurex 540 insulated spandrel glass panel is a laminated composite consisting of ceramic-backed spandrel glass, an insulating core material and a finished interior. This solution provides a low cost, glazing option for all curtain wall, spandrel and window applications. 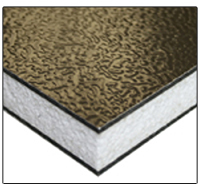 Endurex 540 panels can be produced in any thickness desired and with our full variety of insulation types in order to meet a specified insulating value. There is no panel substrate necessary for the face – the spandrel glass is sufficient. However, any of our standard substrates can be selected for the panel back. See Features and Benefits tab for more details. If the panel back is visible, our full line of architectural finishes is available for the back of the panel in order to meet the desired look for the interior. The Endurex 350P provides the longest lasting architectural finish available on the market. This 1/4″ veneer in-fill panel has a Porcelain-on-Steel face (CeramicSteel) that is more durable than anodized or Kynar finishes. The panel can be cleaned repeatedly with paint thinners without discoloring the finish, as would be seen on a Kynar painted panel. The Endurex 350P is an ideal panel for areas where graffiti or surface scratching is a problem. The panel is offered in ten standard colors. Custom colors also available with minimums. Textured finish is also available. The Endurex 550P provides the longest lasting architectural finish available on the market. This 1″ insulated in-fill panel has a Porcelain-on-Steel face (CeramicSteel), harder than anodized or Kynar finished aluminum. The panel can be cleaned repeatedly with paint thinners without discoloring the finish, as would be seen on a Kynar painted panel. The Endurex 550P is an ideal panel for areas where graffiti or surface scratching is a problem. The panel is offered in ten standard colors. Custom colors also available with minimums. Textured finish is also available. Endurex 535 panels are manufactured to meet the requirements of a standard 1″ insulated glazing panel. Panels can be up to 4 1/2″ in thickness with an STC rating up to 55. We presently have two STC rated panels tested in accordance with ASTM E-413: 3 1/4″ thick with a tested STC rating of 42 and 4″ thick with a tested STC rating of 45. Panels can be tested in other thicknesses and other panel make-ups to meet STC ratings up to 55. The Endurex line of exterior architectural products focuses on extending the life of the building. The Endurex 300 is the most innovative “next generation” glazing and storefront panel available. This 1/4″ in-fill panel features .015″ smooth or embossed Aluminum on both sides of a solid thermoplastic core. Endurex 300 combines all the best features of moisture and impact resistance with excellent rigidity. The panel is both Class “A” fire-rated and formable if required. The Endurex line of exterior architectural products is the most innovative “next generation” glazing and storefront panel available and focuses on extending the life of the building. The Endurex 315 is a 1/4″ glazing panel that features .032″ Kynar or Anodized finished Aluminum on both sides of a corrugated plastic core, which allows virtually no moisture absorption. Corrugated plastic is less rigid and impact resistant than composite or hardboard stabilizers, but is lighter in weight. Available in a Kynar paint or anodized aluminum finish with a 20-year limited warranty. The Endurex 325 is a 1/4″ glazing panel that features .032″ smooth or embossed Aluminum on both sides of a tempered hardboard core. The hardboard is more rigid and impact resistant than a corrugated stabilizer, but can absorb moisture if panel is not properly sealed. 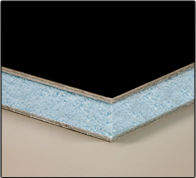 The Endurex 335 is a 1/4″ glazing panel that features .032″ Kynar or Anodized finished Aluminum on both sides of cement board. Endurex 335 has very good fire and moisture resistance as well as excellent rigidity. Finish is a Kynar paint or anodized aluminum with a limited 20-year warranty. EnduroBond is an exceptionally high quality aluminum composite panel (ACM). Primarily used as a cladding panel as part of the exterior building envelope, it can also add a distinctive and decorative look as an interior wall or ceiling panel. Available in an almost endless array of colors and metallic finishes, EnduroBond provides the architect and building owner the ability to make their building distinctive, long lasting and modernistic. The panels are perfect for forming the edges, adapting to the curvature of the building, and as accent panels around windows and entrances. 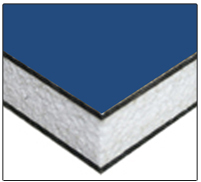 EnduroBond is offered in 4mm thickness and in both a standard polyethylene (PE) and fire rated (FR) core. Nudo custom made EnduroBond provides the solutions for specialized color requirements and unique anodized or metallic finishes. From the smallest renovation to the largest hi-rise, EnduroBond can make your vision a reality.